In the recesses of Berkeley High School’s auditorium is a safe haven that could be mistaken for a janitor’s closet. The room feels so removed that even with one step inside, the daylight diminishes into the black, windowless walls. At 11:38 a.m., you can barely hear the bell ringing in that little niche — only the far-off wailing of a muted jazz trumpet on the other side of the wall. But hours of morning respite suddenly break, as students — backpacks hoisted over their shoulders — funnel into the room from their classes. There are only four or five students, but the room already feels cramped. 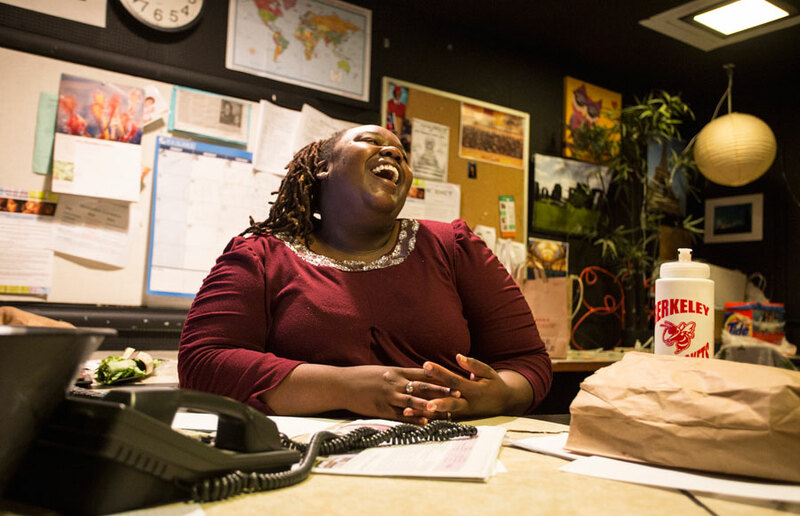 In their midst is Sophina Jones, a counselor sitting comfortably behind her desk. On any given day, as many as 14 students are stuffed into Jones’ office for lunch. The room sprouts new life as some students chat, while others perch on the cabinets, their legs dangling with their notebooks nestled into their laps. It feels like any other classroom at lunch — a cacophony of voices, laughs and conversation. With a passing look, the possibility that these students are homeless wouldn’t cross the mind. As Berkeley Unified School District’s McKinney-Vento counselor, a position instituted through the federal McKinney-Vento Act to work with homeless youth, Jones works with as many as 480 students who experience some degree of homelessness — a number that oscillates as families continue to find and fall out of housing. In April, Berkeley City Council heard a recommendation to streamline more funds for transition-age youth, or those from ages 18 to 24. For those under 18 and still in school, however, Jones is one of the only resources available. As many homeless youth and their families search for basic shelter and food, they tend to become mentally removed from their schooling and face difficulties finding constants in their lives as they come of age. Jones acts as one of those few constants — one of the few who sees these students’ reality. But everywhere else, homeless students blend into their surroundings, disguising themselves with polished veneers to avoid potential ridicule. Stepping into Jones’ office with clean shoes, they wear sweatshirts fresh off the racks of any middle-class retailer, wield smartphones and appear just like anyone else at their school. Jones said many families experiencing homelessness choose to shelter their image rather than sheltering themselves, spending what little income they have on maintaining the facade. Even Jones’ cabinets hide sundries for her students — not pencils and notebooks, but deodorants, toothbrushes, soaps, feminine products and toothpaste. It’s like any other morning at school, and Sienna Crockett’s eyes sting as she stretches her eyelids apart, which feel heavier and heavier by the second. On most weekdays, from 8:30 a.m. to 2:50 p.m., Crockett’s schedule is packed with six classes. This time, it’s only Crockett’s first period at school, and she’s already blinking every few seconds, fighting to stay awake. It was three hours before, at about 5 a.m., when she pulled herself out of bed, a routine undergone every morning as she embarks on a journey from a safe house in Alameda to her school in Berkeley. Younger children — such as 14-year-old Crockett — navigating homelessness with a parent can sometimes find shelter in Berkeley at Harrison House and the North County Women’s Center, but both places have a limited capacity. Even scarcer are options for unaccompanied homeless youth: the teens who have left abusive or unstable homes and are on their own. Potential sanctuaries exist outside Berkeley at two shelters specific to unaccompanied youth under 18: DreamCatcher in Oakland and Calli House in Richmond. The insufficient shelter space in Berkeley, coupled with rising housing costs, has forced many youth and their families either into others’ living rooms or out of the city. For Crockett, the commute from Alameda is taxing, but not as taxing as the chatter and raucous noise that keeps her up most nights. Even during the shelter’s designated quiet hours, Crockett has grown accustomed to the ruckus that floods her ears despite the music pounding from her earbuds. It’s 10 p.m., and she wants to sleep. But she and her mom, Chamisa, share a small cubicle with another family, with nothing but a thin wall separating them from the rest of the dormitory’s 30 other women and 14 children, many of whom are up playing with one another and their toys until close to midnight. There’s no privacy living in a shelter, but it’s a change from years of hopping among hotels. There, she and her mom enjoyed privacy, though they’d have to constantly uproot themselves, chasing cheaper prices. It was with Jones’ support that Crockett and her mom eventually relocated to a safe house in Alameda, which is the closest thing to home consistency Crockett has experienced while attending school. Many other homeless youth who choose to attend Berkeley schools are scattered around the East Bay, and Jones helps facilitate transportation to and from campuses and counsels students in their academics. But there’s only so much Jones can do for students whose chronic limbo can’t be freed from their minds. Many of them are inevitably drawn away from enjoying their education, out of exhaustion, shame, despair and even habit. For Jada Carter, 16, the consequences of this limbo were hard to leave at the door of her classrooms. Having spent her adolescence in public housing complexes in the Midwest, Carter has known poverty her entire life, even after her mother plucked her and her family out of the rust belt and into Berkeley to escape the incessant homelessness her family was cycling. Disconnected from her home, Carter felt disconnected from her school. In the classroom, she thought less about her lessons and more about the pains of working multiple jobs when her mom could no longer support them both. Eighteen years old and wide-eyed, Stephon Brewster can almost relive the time when he was Crockett’s age and suddenly heaved out of his home. After his landlord raised their rent, he and his mom spent every night of his freshman year of high school sleeping in a car. That year, he failed nearly all of his classes, introducing unexpected pressure into his life. That pressure — the pressure of trying to conquer his life-long struggle with homelessness as he enters adulthood — is a fear Brewster can’t shake, particularly as he becomes a college student. Other youth, such as those exiting foster care, often end up on the streets, while other youth leave their families because of abuse. After maxing out their 18-month stay at Harrison House, a shelter in Berkeley, Brewster and his mom are now couch surfing. His siblings in the area won’t take them in. It feels like an upgrade from the distress of sharing a dormitory with other families and navigating the interiors of a fractured welfare system. Older youth tend to double up with other families or curl up on a sofa in the living rooms of their acquaintances for a night’s sleep. Stays are indefinite — there’s no predictability, no guarantee — when anything could trigger a host to sever the informal housing agreement. Juggling the daily concerns that come with homelessness and the existential questions every student entering college has to grapple with becomes a constant project, he said. The widespread anxiety among homeless youth who are approaching adulthood often arises from the cultural expectation that postgraduation, a youth should embrace and conquer newfangled independence as an adult, according to Grant, who helps shelter older youth who are exiting foster care or abusive homes or who have lost their jobs. Besides YEAH, which operates five or six months of the year, the only other housing programs available for homeless, transition-age youth in Berkeley are at Fred Finch Youth Center. Currently, there are only 43 affordable-housing units in Berkeley designated for transition-age youth. The struggle for homeless youth becomes even greater, Grant said, when the unemployment rate for young people in general is so stacked. In 2014, youth ranging from 16 to 24 years old saw the highest rates of unemployment nationwide — rates that were even higher among young underrepresented minorities. Specifically, youth between the ages of 16 and 17 experienced an unemployment rate of about 21 percent, compared with the 5 percent experienced among adults between the ages of 25 and 54, according to the U.S. Bureau of Labor Statistics. Councilmember Max Anderson, in a City Council recommendation to provide $125,000 to transition-age homeless youth housing support stipends, credited high rent prices — on top of a lack of affordable housing options — as severe impediments to achieving stable housing, even when homeless youth are employed in a minimum-wage job or enrolled in school. Brewster casts down his eyes as he describes how the high price of living in Berkeley has prevented people from accessing basic housing. Now that he’s passed his high school exit exam on his first try, however, Brewster plans to graduate early, take some community college classes and get a job to try to support himself — something he considers an ideal start coming out of homelessness. A young artist named Matisse kneels down on a floor that looks like a Jackson Pollock, sanding off a chair he plans to paint for his grandmother. The consistent scratching doesn’t bother the dozens of teens who are stationed around a rectangular table, lost in the movement of their brushes and captivated by the feel of paint as it slides and sets on a canvas. Their energy ricochets off the shelves of housing supplies, off stacks of old and forgotten canvasses kept for reuse, and off dozens of vibrantly tinted paintings lined along the walls. Accompanying each frame is little slice of paper that displays the artist’s name and the selling price. When Wilson leaves Jones’ office at the end of the school day, she makes the voyage from one refuge to another: a hole-in-the-wall art studio on the opposite side of town called Youth Spirit Artworks, or YSA. 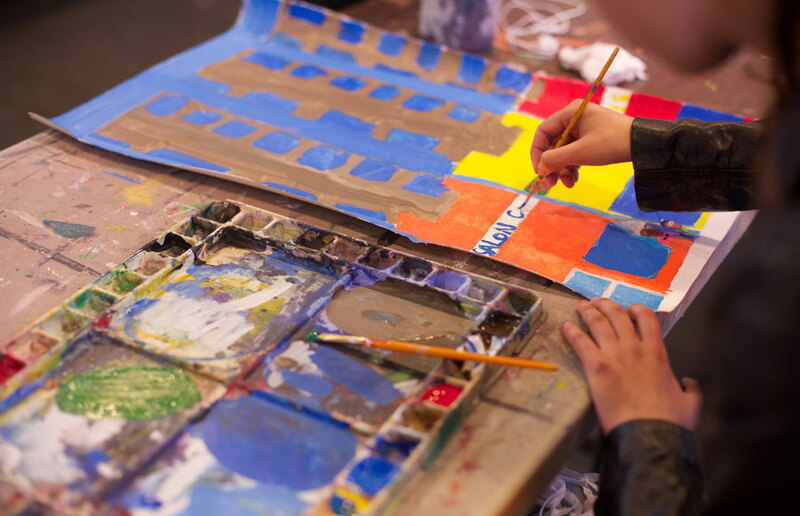 During the week, students — including Carter and Brewster — trek from their high school to the studio, where they develop their own artwork, execute art projects with their peers and cultivate skills as a way to begin entering the job market. 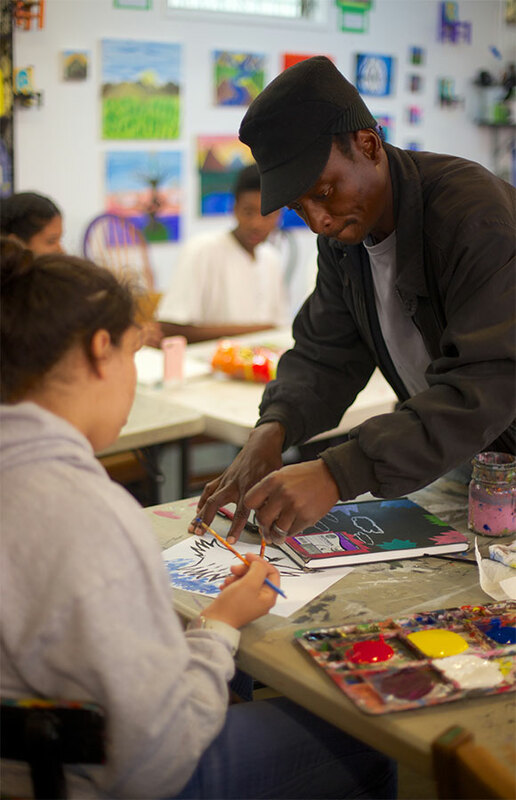 YSA is one of the few targeted programs in the city in which transition-age youth experiencing poverty, fractured homes or homelessness can begin to experience entrepreneurship and business, learn how to set prices for their work, and discover the ways in which the demand for art influences the prices they can set. Many of the youth begin funding themselves with the art sales, said YSA associate director Danielle Gibbins. But even more, the studio is a creative outlet for Wilson, Carter, Brewster and their peers — a place where they can purge themselves of the negativity in their lives. 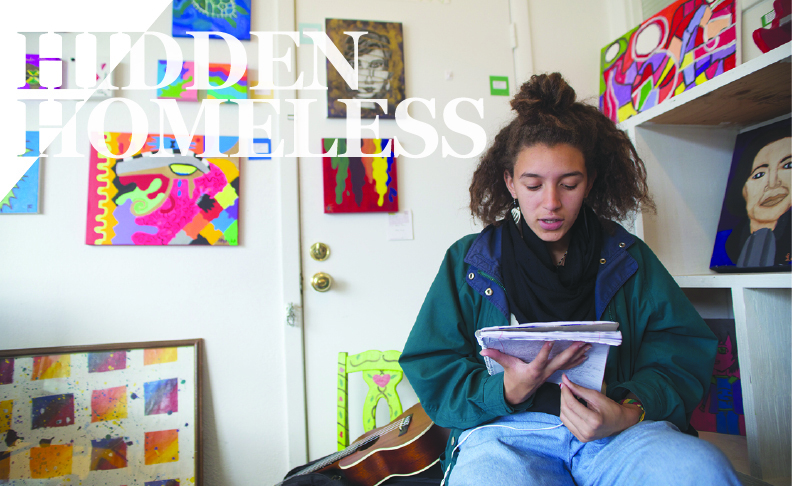 The studio makes it easier for youth to deal with their homelessness, said YSA art director Victor Mavedzenge — though he said such spaces are hard to come by in Berkeley. Services needed by some of the more vulnerable populations tend to get cut during a budget crisis, said Councilmember Jesse Arreguin, who added that the city lacks the resources it needs to serve the youth. The threat of cuts to such resources is ongoing. City Council is currently considering a proposal to zero out YSA’s community agency funding — a move that will be discussed at a June 9 meeting, during which the council’s budget for next year is to be approved. But Mavedzenge said there is no straightforward cure to what he called a “societal disease,” where the fabric of society itself has ruptured, even with programs such as YSA surviving. Day to day, he approaches the problems of homeless youth by inspiring his students to find purpose. Wilson, for one, holds onto her education as an exit. Most homeless youth, however, don’t have the heart to fight through their schooling anymore, Jones said, because of years of struggle that have been internalized. Jones herself grew up homeless with a substance-abusing mother and barely emerged out of high school, with some D’s and F’s imprinted on her record. She displays her high school transcript and college diplomas on her wall as gentle reminders to students — all of whom are teenagers navigating homelessness like she once did — that there are ways out of poverty. Contact Bo Kovitz at [email protected] and follow her on Twitter @beau_etc.